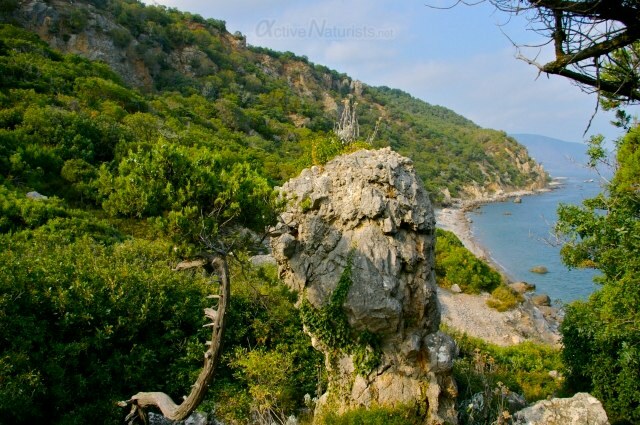 One of very few places where primeval dry subtropical forest meets the sea on the South coast of Crimea. Simply a beautiful place! 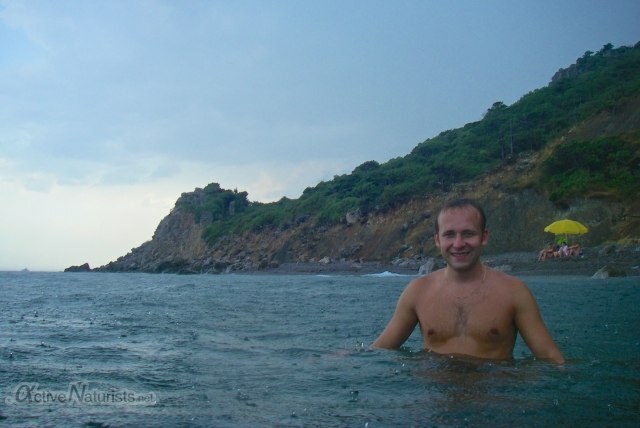 This is my last post about naturist places in Crimea for now. 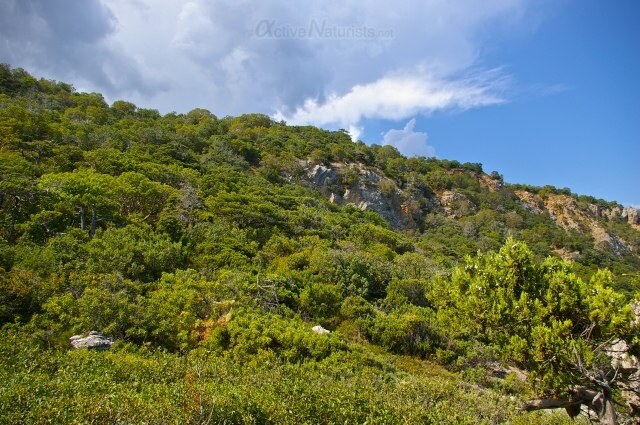 Probably you’re surprised to hear about subtropical forest in Ukraine Russia (depending on your political views and the map issued by your state), but the South coast of Crimea is indeed one of the northernmost areas with subtropical climate, as it is protected from northern winds by Crimean mountains and warm Black Sea keeps temperatures milder. 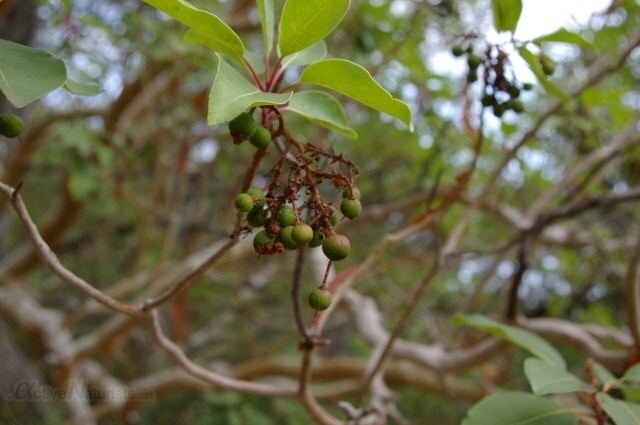 The protected forest of Nikita, officially known as Cape Martyan Reserve, is right next to the Nikita Botanical Garden (and formally, it is a part of it), and it hosts some plants that are common in the Mediterranean, for example, arbutus, or strawberry tree. I couldn’t resist resting on low branches of one of those the way to the beach: the bark is very smooth and has a very pleasant, slightly velvet-like, touch. Just too bad its strawberry-like fruit were not ripe yet. First time, I was came the beach walking by the shore starting at this point, where I also paid a park fee, but sometimes it was too rough too hike through the rocks, and later I discovered that it was easier to walk by the trail starting here. In both cases, you can use trolleybus #34 from Yalta in the direction of the Nikita Botanical Garden. When I first reached the beach, it really appeared like paradise lost! By the way, Cape Martyan Reserve does not only include the forest but a part of the sea too, with many fish species. 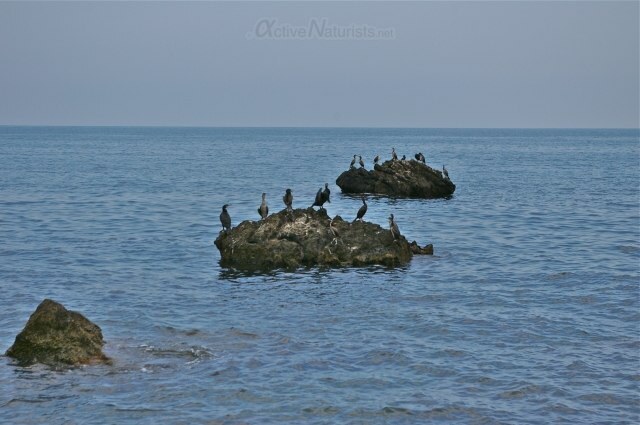 Numerous cormorants resting on the rocks indicated at the sea riches. 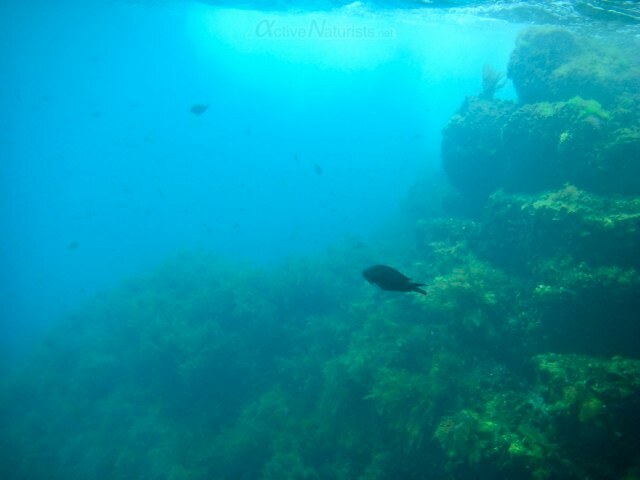 And indeed, the underwater rocks seemed teeming with life. Second time, I brought my sister too. She is not an adamant nudist like me, but she was impressed by my photos from the first trip to cape Martyan and was eager to come along. We got some rain, but we didn’t mind it, as it was warm. we climbed some of those strawberry trees again. What a nice day it was to celebrate both the rain and the sun! Previous postWorld Naked Bike Ride NYC 2012 – [modest] success! Delightful account and pictures. I share your interests in nudism in the great outdoors and floristics – I didn’t know there were wild strawberry trees there on the Crimean Peninsula. 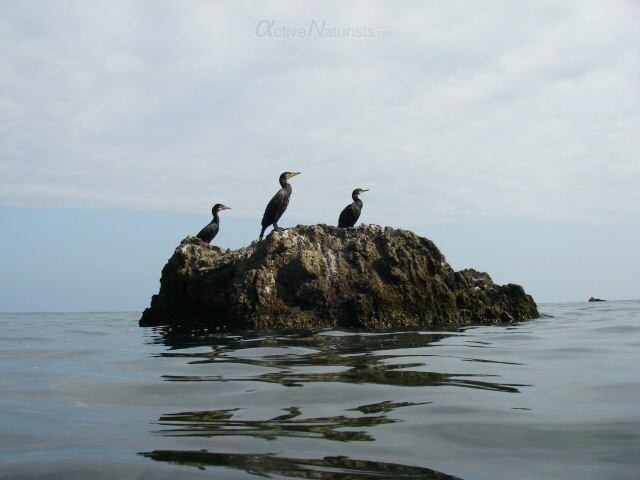 It shows the Crimean Peninsula is special as a floristic meeting point (between the boreal Euro-asiatic forests and the Mediterranean flora) as well as a cultural meeting point between Europe and Asia. Exactly, that’s why this peninsula is such a gem! What a beautiful setting; it looks idyllic. I hope you and your sister have many happy times there. Wonderful, you never fail to please the curious mind. Of all the places I’ve seen (so far!) 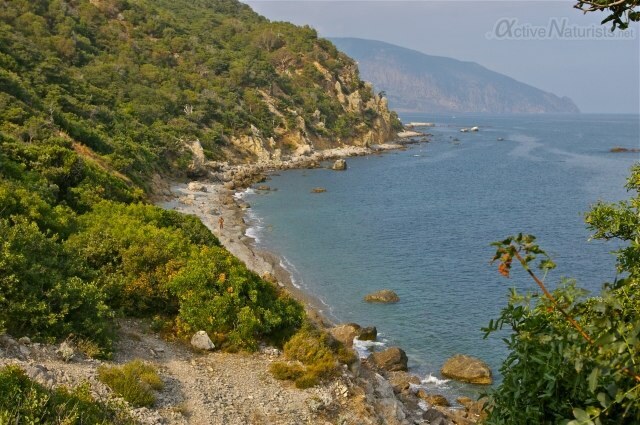 in your blog, the one I’ve really enjoyed the most was Nikita Beach and Forest in the Crimea. That place is just drop-dead GORGEOUS! I’m definitely putting Nikita Beach and Forest up on my list of Places I Want To Visit Before I Die! Man I enjoy your blog, makes me smile, vacation does not consist in the cityscapes alone. Enjoying the inner child never hurts, and soaking up sun like the aimals good deal. Brov that’s funny, the Crimean melon of God pose.